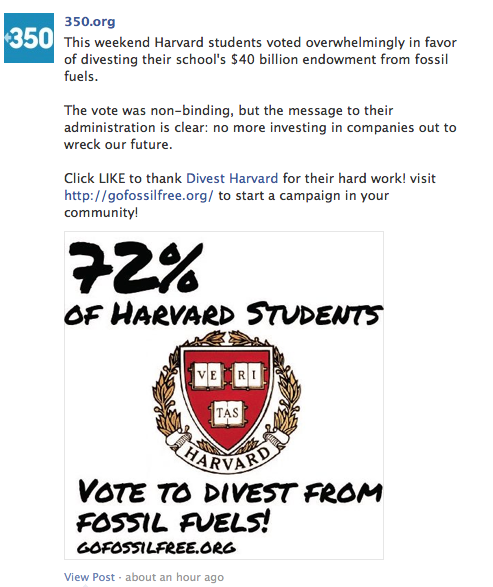 The fossil fuel divestment campaign at Harvard (Divest Harvard) has had an exciting week. Our referendum on the student government ballot passed with 72%, and news is spreading around the country. We got a mention on the 350.org website, and 350’s social media is alight with news of Harvard’s fossil fuel divestment campaign. We hope that this will inspire other students around the nation as they mobilize their campuses. We also hope that this will put Harvard one step closer to divesting from fossil fuel companies! 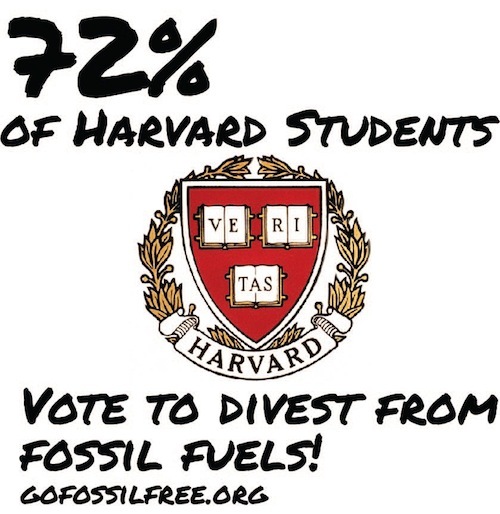 Cambridge, MA—Last Friday night, the Harvard College Undergraduate Council announced that the student body had voted 72% in favor of Harvard University divesting its $30.7 billion endowment from fossil fuels. The Divest Harvard campaign, supported by Better Future Project and 350.org, is part of a quickly-growing fossil fuel divestment movement that has spread to over 50 universities and colleges across the country. Inspired by the 1980s divestment movement the helped end apartheid in South Africa, the groups hope that fossil fuel divestment will help solve the climate crisis by stigmatizing the fossil fuel industry and supporting a clean energy future. 350.org founder, and Harvard alum, Bill McKibben is currently on a 21-city Do the Math tour which is promoting fossil fuel divestment to sell-out audiences across the country. Over 2,000 people attended the event in Boston at the Orpheum Theater last Thursday night. The divestment campaign has scored some early victories across the country, with Unity College in Maine announcing they would fully divest their endowment and the Mayor of Seattle pledging to look into divesting city funds. Students at Harvard hope that the overwhelming support for the resolution will convince President Faust to end her refusal to meet with them to discuss divestment. The President recently stated in a public forum that Harvard University only divests in “the most extreme of circumstances” and that no issue made her feel “compelled to divest” at this time. In the past, Harvard University has divested from tobacco corporations, corporations that supported the genocide in Darfur, and (in part) corporations involved in apartheid South Africa.